My “Real or Fake” series on vintage furniture is, by far, the most popular draw to the JetSetRnv8r site. I’ve received lots of emails asking about other pieces, but none more than Ludwig Mies van der Rohe’s iconic Barcelona Chair, also known as the MR90 so here it is. Like the other pieces in my series so far, Corbusier’s LC chair, Eames’ Lounge 670 and Ottoman 671 and Noguchi’s coffee table, the Barcelona Chair is one of the most popularly knocked-off pieces of mid-century modern furniture. It’s familiar to everyone because there’s a version of it in nearly every furniture store in the world. As with many modernist pieces, its simplicity makes it easy to duplicate. Many copies are of exceptionally high quality – some would argue even better than the real thing. This is a case where you can get a good quality knock-off at substantial savings, but, as always, if you’re buying for investment value, only the real thing will do. 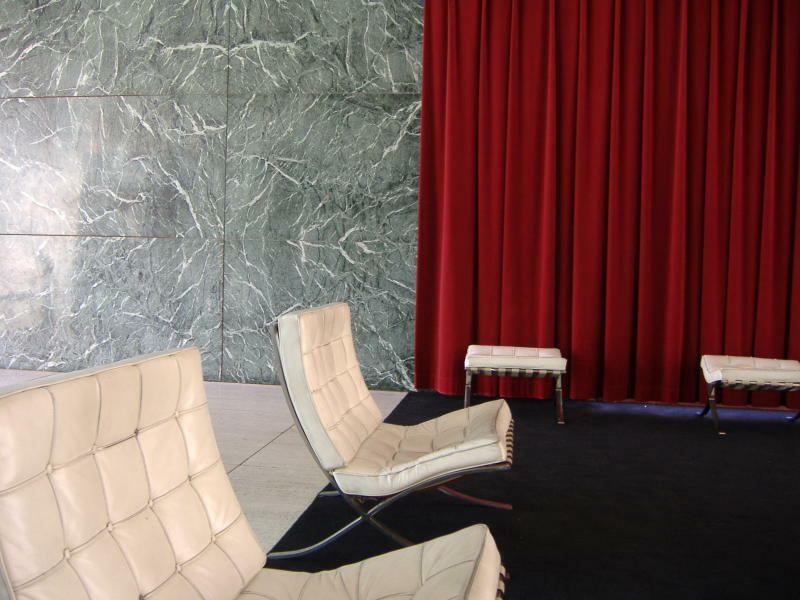 The Barcelona chair was designed in collaboration between Ludwig Mies van der Rohe and his partner and companion Lilly Reich in 1929 for the German Pavilion at the Barcelona International Exhibition. Two of these chairs and two matching ottomans were the only pieces of furniture in the pavilion. The chairs were created as thrones for the visiting King and Queen of Spain, and the ottomans were for their attendants. Soon after the closing of the pavilion, the chair went into production at the Bamberg Metal workshop in Berlin. Although the modernist ethos was to build furniture cheaply for the masses, the Barcelona chair was extremely difficult to manufacture and was fabulously expensive from the start. The earliest versions were made from welding low-grade steel plates in a flat finish – not chromed as they are today – upholstered in white kid leather. Thonet took over production in 1932 until 1948 when Hans Knoll’s wife, designer Florence Knoll, purchased the licensing rights to most of Mies’ furniture and Knoll began manufacturing the chair, which they still do to this day. The chair was such a big seller that Knoll created a whole line of Barcelona furniture inspired by the chairs including Barcelona stools, the Barcelona Daybed, Barcelona Benches, Barcelona sofas, Barcelona coffee table and the Barcelona side table. Many of these pieces are mistakenly attributed to Mies by people who should know better (hear that, DWR catalogue?) but he did not design them. 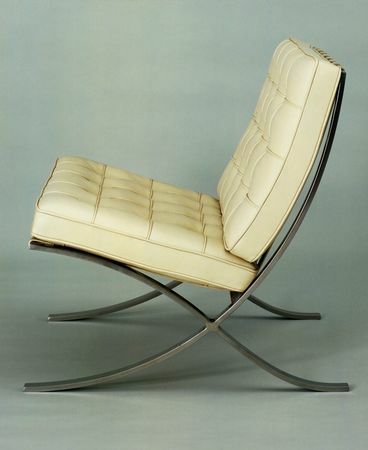 Although stainless steel had been around since the turn of the century, it did not come into popular use until the 1950s when Mies redesigned the chair to be made from this superior material. Today, the chair is available in a choice of two finishes – chrome plated and polished stainless steel. The two are nearly undistinguishable to the untrained eye, but if you saw them side-by-side, the polished version has a more “liquid” finish. And there is a significant difference in cost – Knoll charges $4,083 for the chrome plated model and a staggering $6,235 for the polished stainless. The matching ottomans are an additional $1,930 and $3,608, respectively. So the next time you see a stately pair of Barcelona chairs and ottomans in a sleek modernist home, you can appreciate the fact you’re looking at nearly $20,000. Unless, that is, you’re being deceived by clever fakes. The chair is easy to copy and passable versions are available for as little as $329 online, or $635 including an ottoman. Good quality reproductions can be had for $800 and up. The real deal is made in the U.S.A. but fakes come from Italy, Brazil, China, India, Korea, Vietnam, Russia and Romania. You’ll often see them called “Pavilion Chairs” to avoid trademark infringement. 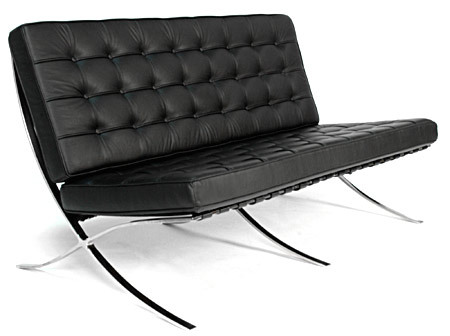 Knoll modified Mies’ design fairly significantly making today’s chairs very different from the original thrones. Since Knoll took over production, they are generously proportioned and nearly square at 30” high x 30” deep x 29.5” wide with a seat height of 17”. They feature supple leather cushions that subtly follow the curves of the frame and are held in place underneath by matching leather straps. There are no visible welds or seams and the finish is flawless. Once you’ve studied one, the fakes will be easier to spot. The first give-away is the proportions. 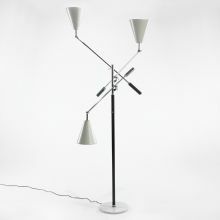 Many cheaper fakes are visibly smaller or appear to stand taller than they are wide – Knoll’s version appears wider than tall. The cushions are often straight and stiff. The leather cheap and shiny. Whereas the Knoll version is upholstered with twenty individual panels, cut and hand-welted and tufted with matching buttons, cheaper copies are simply one piece and pleated. Knoll ottomans stand slightly taller than the edge of the chair seat – many copies have a lower (and more comfortable) ottoman. So if you’re buying vintage, how do you know if you’re getting the real thing? First look for the Knoll Studio logo and Mies’ signature stamped onto the frame. Without that, it’s a fake. If it has the stamp but you think it may be counterfeit, double-check the dimensions of the chair. Then look at the quality of the leather and make sure it’s not a single pleated piece. Check the quality of the leather straps – if they’re vinyl or nylon, walk away. Lot 167 from the 10/25/08 Sollo Rago modern auction. Estimated at $3-5,000. Sold for $6,000. 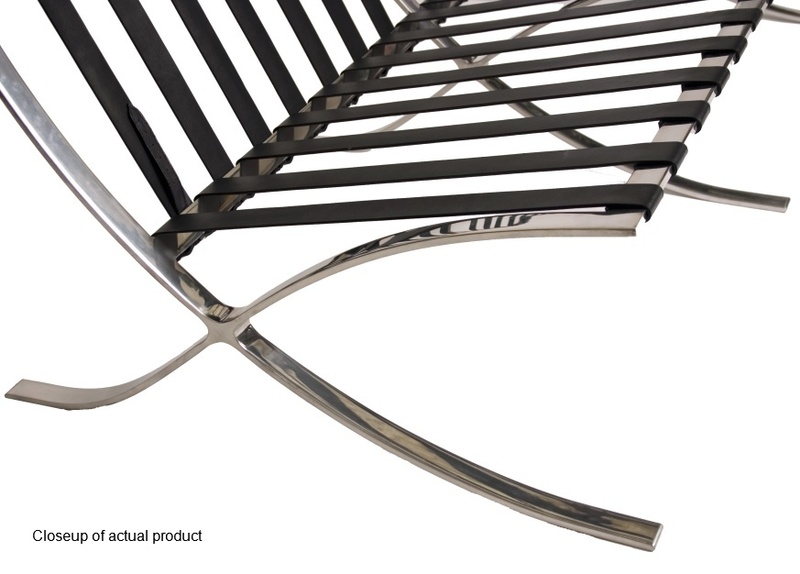 But if you insist on buying new, buy from an authorized Knoll dealer or reseller like Design Within Reach. If it hurts to write that check, you can comfort yourself with the knowledge that Knoll pays a royalty on each chair to the Museum of Modern Art who now owns the design rights. They should throw in a free museum membership for life with each chair. 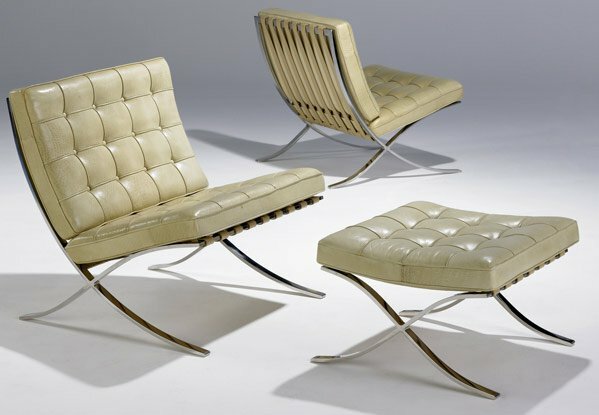 Of the 157 lots that did not sell, many were assorted tables and chairs by George Nelson, George Nakashima, Vladimir Kagan, Hugh Newell Jacobsen, Florence Knoll, Finn Juhl, Gio Ponti and, surprisingly, various pairs of Mies van der Rohe’s Barcelona chairs reasonably priced between $5,000 and $7,000. A Swan Chair by Arne Jacobsen estimated between $4,000 and $6,000 sold for a conservative $4,800 – considerably less than prices as high as $7,200 I’ve seen in recent years. 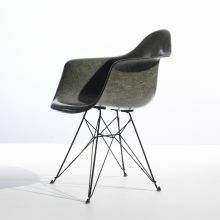 A chair by Charles Eames and Eero Saarinen for the MoMA Organic Design Competition which was expected to get between $15,000 and $20,000 sold for a whopping $50,400. 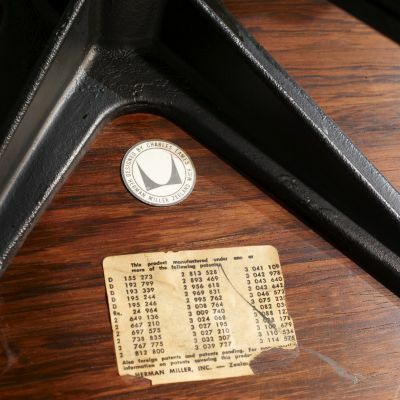 An Eames DAR shell chair on an “”Eiffel” base that was expected to get between $500 and $700 got a remarkable $5,400. 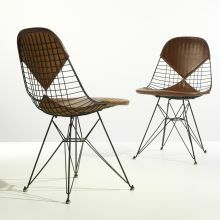 A pair of Eames DKR wire chairs with “bikini” slip covers that were projected to get $500 to $700 roped-in $3,000. 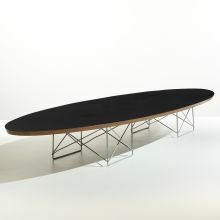 An Eames ETR “surfboard” coffee table that was projected to get $3-5,000 sold for $24,000! Kowabunga, dude! 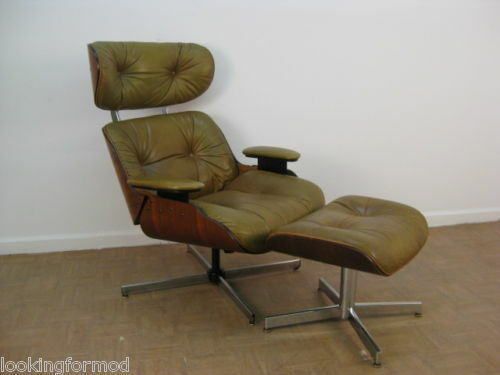 Readers of my posts on the Eames Lounge 670 and Ottoman 671 will be interested to know that a vintage rosewood model by Herman Miller sold for $3,120 – within its projected range of $3,000-$4,000 but way below its historic high of $7,000. 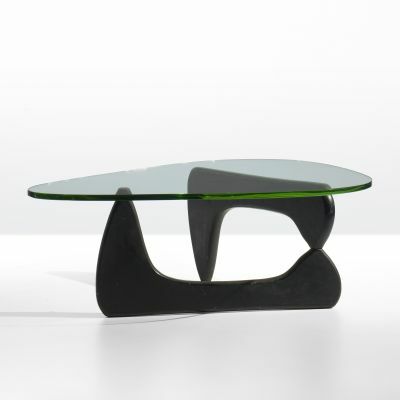 And an early Noguchi coffee table in ebony with a rare green-glass top was a bargain at $1,920, a bit shy of it’s projected range of $2,000-$3,000 and far less than the $6,600 the same table got at the same auction last year – perhaps a sign of the times. So how does this compare to years past? There are too many variables to make a definitive apples-to-apples comparison but Wright’s October 2007 Modern auction raked in $3.9 million (an average of $7,876 per lot) to this year’s $2.1 million ($5,155 per lot) – a stunning 45% drop. And whereas 37% of the lots sold for above the projected range in 2007, only 23% did so in 2008. Unsold lots increased from 21% to 37%. Of special note, Barcelona chairs that sold above estimates for $7,200 a pair in 2007 had no takers at all in 2008 despite a minimum reserve of only $5,000. An Edward Wormley 6329 sofa that sold for three times its estimate for $14,400 in 2007 got only $4,800 in 2008. And a Comprehensive Storage System by George Nelson that sold for a whopping $36,750 in 2007 (estimated at $5-7,000) got a mere $8,400 in 2008. Ouch! On the other hand, anything Eames such as assorted DCW, LCW and RAR chairs all increased in value by up to 450% from last year’s prices. A logical conclusion one could draw from these results is that with so many of the lots by Charles and Ray Eames selling for far above estimates this year and for far higher prices than a year ago, anything by Eames has been a stellar investment for those lucky sellers. Nakashima, Nelson and Kagan collectors? Not so much. But times change and tastes shift so better luck next time. To see the entire results for yourself, visit the Wright20 site here. 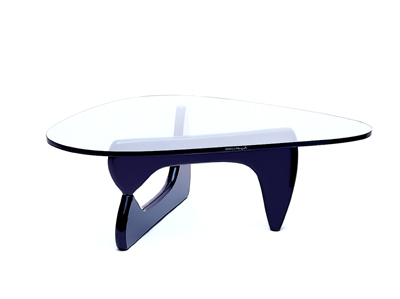 There are few midcentury modern pieces more graceful than the free-form Noguchi coffee table. First designed in 1939 as a commission from the President of New York’s Museum of Modern Art, it was refined in 1944 to accompany an article entitled “How to Make a Table” by designer George Nelson and has endured the test of time to become more popular today than ever. It’s also one of the most commonly knocked-off pieces with unlicensed copies at every price point flooding the market. Like the Eames 670 Lounge and 671 Ottoman, and the Barcelona Chair by Mies van der Rohe, there isn’t a furniture store in the world that doesn’t sell a version of this table. It’s easy to make – anyone with basement workshop and a saw could knock one out in a few hours. But then you could also copy the Mona Lisa with a few crayons and scrap paper but I don’t think it would come any closer to replicating the real thing. Isamu Noguchi believed that there is art in the everyday products we surround ourselves with – in his words: “everything is sculpture”. In that spirit, he crafted two pieces of solid wood, curved and interlocking to create a tripod topped by a gently curving, biomorphic shaped piece of glass. 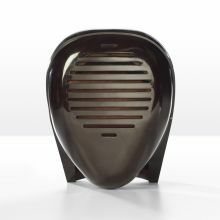 The authentic version from U.S. licensee Herman Miller is offered in cherry, walnut, or ebonized walnut with a top of ¾” plate glass – clear – with flat polished edges, not beveled. Early versions included a solid birch option and used a less expensive green glass top. 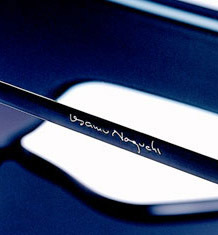 The licensed version measures 16” high by 36” by 50” and carries Noguchi’s signature etched into the edge of the glass top. There’s also a manufacturer’s plate on the bottom that covers his engraved initials. One of the most popular knock-offs, and one that some consider to be of superior quality because it uses a thicker glass for the top, is made by Modernica and retails for $799. To avoid trademark infringement, the overall dimensions differ from the original by a quarter-inch here and a half-inch there. Other, cheaper, knock-offs can be had as low as $499 new – or $50 or less at a garage sale. Solid hardwoods vs. cheaper woods or particle-board and veneer. Labor-intensive hand-rubbed stain rather than cheaper thin coat of spray-on stain that shows scratches and blemishes more readily. Proportioned for perfect balance with a designed-in counterweight vs. cheap copies that are more tipsy. Better quality ¾” clear plate glass with a polished square edge – not beveled – rather than thinner, cheaper glass. I agree that unlicensed knock-offs have an appeal to people on a budget and are sometimes even better quality. But in my mind, it comes down to this – are you the kind of person who gets as much pleasure from owning a fake Rolex watch or driving a Hyundai because it looks vaguely like a Mercedes Benz as someone who owns a real Rolex or a real Mercedes? If you are, fine. Both watches tell time just as accurately and both cars will transport you in nearly equal comfort. But if you’re the kind of person who appreciates art and celebrates and feels enriched by the art in the everyday objects around you, than I would encourage you to find products that you enjoy that you can afford rather than throw money away on cheap versions of something else. I, for one, would love to own a real Picasso. But I can’t afford one and it would bring me absolutely no pleasure to own a forgery. I’d rather seek out and find a lesser-known artist at affordable prices with the hopes that I might be discovering the next Picasso. If I couldn’t afford a real Noguchi table, I’d find something else that I can afford and hope that it becomes tomorrow’s classic. I DO buy vintage furniture with the hopes that it will hold it’s value – or even appreciate. And I’ve lucked-out a few times. Some Hans Wegner chairs I bought for $500 each from a private party sold for $2,500 each to a dealer. And chairs I didn’t recognize and bought for $100 each turned out to be worth $1,250 each when I sold them after their designer, Milo Baughman, had a resurgence of popularity. I recognize that it’s the copies of treasures like the Mona Lisa or Michaelangelo’s David that make the originals even more widely known and coveted – but I would advise against buying knock-off furniture that’s “almost as good” as (or even better than) the real thing. I bet you’d find it more satisfying to find a lesser known original that fits your budget. It may even prove to be a better investment. 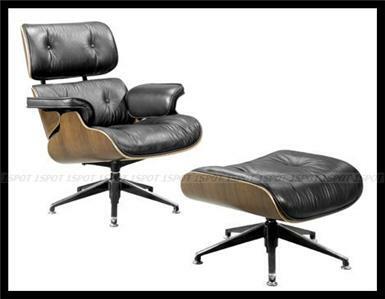 Read more about the Eames Lounge 670 and Ottoman 671 here and the Corbusier LC series here. I’ve also written about how to buy furniture and make a profit. In this installment of “Real or Fake?” we’ll discuss the ever-popular and often imitated Eames Lounge Chair and ottoman, officially known as the Eames Lounge (670) and Ottoman (671). Designed by the remarkable and prolific husband and wife team of modernist architects and designers, Charles and Ray Eames in 1956, this chair was introduced to the public on NBC’s morning show, the Arlene Francis Home Show (which later became The Today Show) and was an instant hit. (Don’t miss the extraordinary 2-part video here.) It’s been in constant production ever since by U.S. licensee Herman Miller of Zeeland Michigan and European licensee Vitra. It’s also one of the most popularly copied pieces and I defy anyone to find a furniture store anywhere in the world that doesn’t sell a version of this chair. Some copies even have their own fans – an unlicensed knockoff from Plycraft by George Mulhauser is considered by many to be superior in both quality and comfort to the real thing and can be had at substantial savings. It’s said to be more ergonomic for today’s larger American frames. Shell of cherry, walnut, santos palisander or rosewood. Any others are likely fakes. Look for six-inch thick urethane foam cushions with soft leather upholstery. 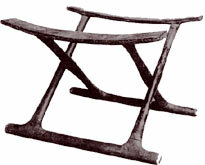 The chair will have a five-legged base (“five-star”) and the ottoman four. Legs rise at a slight angle – they are not flat nor do they rise too steeply creating a “cone” effect. Look for die-cast aluminum back braces – not square tubular aluminum. The bases are also die-cast and painted black with polished aluminum trim. Some copies have a loose cap over the base to hide rough welds or bolts where the legs meet the post. Natural rubber shock mounts and adjustable stainless steel glides. 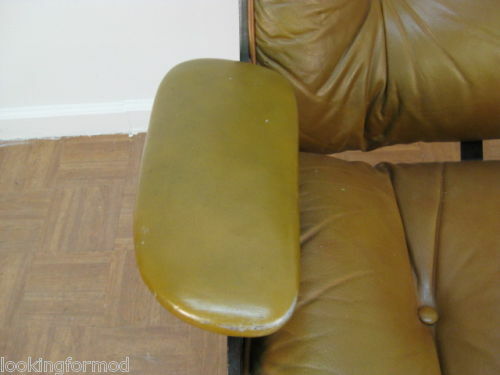 Armrests are curved, not flat. Look at the leather upholstery on the armrest. Fakes often have a single piece of leather wrapped around the edge. Authentic models have a separate piece of leather welting wrapped around the edge. The ottoman is the exact same size as the seat of the chair. In fact, the cushions are interchangeable. Most copies recline, an authentic chair does not. There should be absolutely no visible screws or bolts. None. This fake has a five-legged ottoman and the legs of both chair and ottoman rise at too steep an angle. Otherwise it’s pretty darn close. This copy has a four-legged chair, flat legs, flat armrests and a smaller ottoman. Visible screws are an instant dead give-away. This one is a cheap copy. Flat arms with a single piece of leather wrapped around the edges instead of a second piece of welting is a no-no. 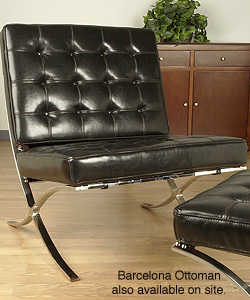 Read about the latest auction results for a vintage Eames Lounge Chair 670 and Ottoman 671 here. Don’t miss my postings on how to tell a real from a fake Le Corbusier LC series chair, a Mies van der Rohe Barcelona chair and a Noguchi coffee table. 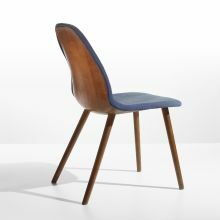 See recent auction results and trends on vintage furniture from Eames and other designers here. You can also learn the smart way to buy quality furniture whether you’re staging a house for sale or collecting for your own home here. Interest in vintage furniture is at an all time high with shows and auctions commanding top-dollar for your grandmother’s tired old Danish modern dining set. Scores of national chain retailers such as Design Within Reach, Modernica and Room & Board offer good replicas of many pieces, or contemporary licensed “originals”. But when buying vintage – whether from a dealer or an individual – how do you know you’re getting an authentic piece? A trained eye knows how to spot the details. There are too many designers and styles to deal with in a single post, so today I’ll deal with Le Corbusier’s LC-series chairs – the ever-popular cube-like chrome and black leather LC2 and LC3 “Grand Confort” chairs. Originally designed in 1928, these pieces have stood the test of time and feel as contemporary today as the day they were first concieved. The chair comes in two sizes, the more iconic Grand Confort petit modele measuring 30″ wide by 27.5″ deep and 26.4″ tall; and the Grand Confort grand modele with the longer, lower, sleeker profile of 39″ wide by 28.7″ deep and 24.4″ tall. Both are accompanied by two and three-seat sofas that share the proportions of the chairs. Note: the chairs are often referred to as the “Petite Confort” and the “Grand Confort” but this is innacurate – both are “Grand Confort” with one being petite and the other grand, kinda like the cup sizes at Starbucks. They may seem ubiquitous because they seem to be available everywhere at every price point. And that’s because anyone can make a chair that looks like a Corbusier as long as they vary it just enough to not infringe on the trademark. They can vary the dimensions, throwing the proportions off. Or the termination of the legs may be different. The welds will almost always be visible and rough. And if it’s vintage and shows any rust, it’s most certainly not the real thing as they never, ever rust. 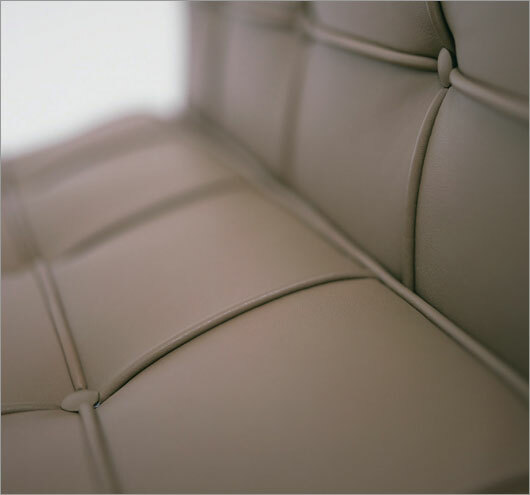 If you’re buying new, there’s only one source for an original – Cassina. They’ve held the exclusive worldwide rights since 1964, granted by the Fondation Le Corbusier. Cassina has their own stores in select cities and sell through other retailers everywhere. 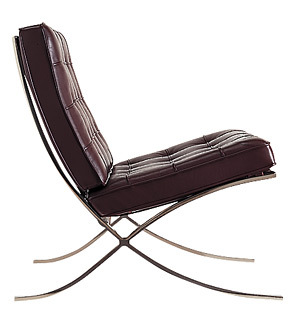 So if you want the real thing, just ask if it’s made by Cassina and check the tag and paperwork that comes with it. But if you’re buying vintage, know what to look for and never take the dealer’s word for it – it’s amazing how often they’re wrong. Rule 1: If it’s cheap, it’s fake. An authentic LC2 or LC3 Grand Confort chair starts at $3,200 new and prices range from $2,000 and up for good vintage pieces. If you think you’re getting a bargain for much less than that, the joke’s on you. Rule 2: Just because it’s expensive doesn’t mean it’s real. There are a lot of good fakes – some are even better-made than the real thing – but they are not going to retain their value like the real thing. And ignorant (or ambitious) sellers can ask outrageous prices. Rule 3: Know where to find the serial number. 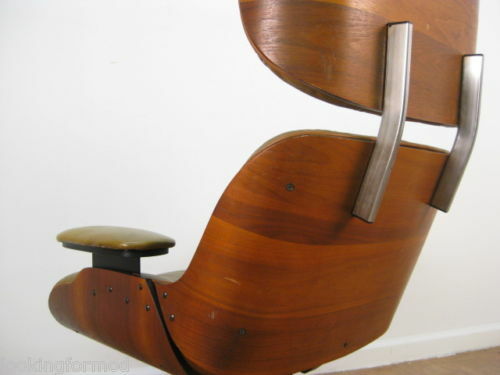 On Le Corbusier’s LC2 and LC3 chairs, feel under the upper-most chrome bar on the left arm of the chair. Authentic chairs have a serial number etched into the chrome – you can feel the bumps with your fingers. On some vintage pieces, the placement of the serial number may vary – sometimes it’s behind the backrest or on the right arm bar – but most years it was on the left side. A great side-by-side analysis of the real thing vs. a knock-off can be seen here. If you can’t afford the real thing but want a good fake, look at the weld seams and the legs. The legs should end cleanly with a chrome end-piece – not with a rubber cap and not with tapered ends. 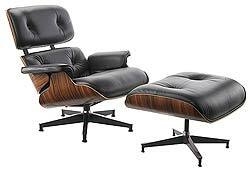 Learn about how to tell a real Eames Lounge Chair 670 and Ottoman 671 here. 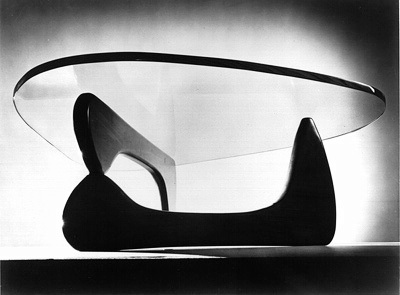 And in future postings, I will write about Mies van der Rohe’s “Barcelona” chair and ottoman, Noguchi’s coffee table, Arne Jacobsen’s “Egg” and “Swan” chairs, and other iconic – and often imitated pieces. Read about recent sale prices at auction here. And don’t miss the smart way to buy quality furniture whether your buying for yourself or staging a house for sale here.